Chateau / Country House753 sq. 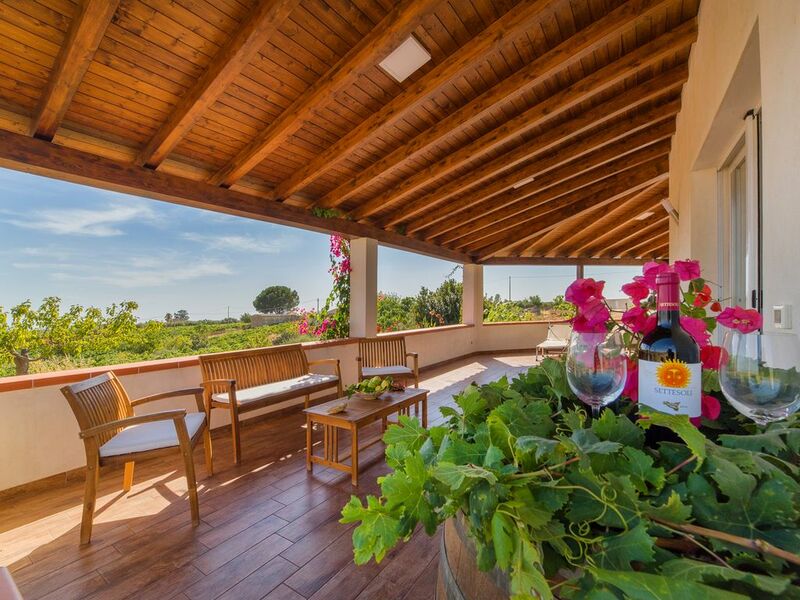 ft.
Immersed in the tranquility of the countryside, among vineyards and olive groves, you can spend your holidays relaxing admiring a beautiful sunset on the sea, sitting on your veranda. At about 9 km from the beaches of Porto Palo, "Blue Flag" for 20 years for its pristine sea and not far from tourist locations such as the Acropolis of Selinunte, Sciacca with its art ceramics, Erice and its medieval village , the salt marshes of Marsala, Agrigento and the Valley of the Temples, Monreale and Palermo. The house consists of kitchen-living room, bathroom, utility room, porch, solarium and garden and is equipped with deck chairs, mobile barbecue, ample internal parking with 6 cars, independent access by automatic gate, solar hot water, hair dryer, washing machine, drying rack , iron and ironing board, espresso machine, kettle, toaster, microwave, fridge-freezer. Just a few kilometers from the beaches of Porto Palo and Lido Fiori, awarded for more than 20 years with the prestigious Blue Flag for its pristine beauty and cleanliness. If you wish you can also book tourist excursions by boat or sailboat from the port of Porto Palo and easily contact the wineries, oil mills and local dairies to visit the companies and buy our food and wine products.